The Neko rig has pretty much taken bass fishing by storm, and for good reason. It gives plastic baits a different, more natural look as they fall and as they move along the bottom. I am the biggest ever fan of the Neko rig. I’ve caught bass with it all over the country. But, like everything else in bass fishing I knew it could be made better. 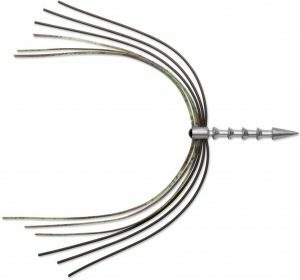 And so, with my partners at VMC, we developed a skirted weight that’ll add a different look to your lure, regardless of which one you choose to rig with this bad boy. We started with one of our nail weights. We drilled a hole through it so that we could run the strands of the skirt completely through the tungsten. We wanted something that looked like the real thing and, at the same time we wanted something that was easy and convenient to use. We used a combination of silicone and living rubber in the skirt. Each has advantages and disadvantages. We wanted the advantages of both, and none of the disadvantages. And, we held the strands in place with an epoxy resin into the hole to hold everything in place. When all was said and done we had a perfect Neko weight. I’m as proud of it as I am of anything I’ve ever worked on during my fishing life, and believe me when I say that’s a lot of stuff. You can use our skirted weight exactly like you would a regular weight. Insert it in the fat end of your lure and you’ll be good to go. That’ll make for a feeding minnow look as the lure falls, straight down. Pull it straight up with a few gentle twitches of your rod tip and then let it fall straight back down on a semi-slack line. You don’t have to get real technical about pulling it up. The only reason you do that is so it can fall back down. You can make a Neko rig with almost any plastic lure. My favorite is the Berkley Bottom Hopper. It’s sold in both the Havoc and the Powerbait versions. My other favorite bait is the Havoc Flat Dawg. It’s 5 inches long and it’s perfect for Neko rig bass fishing. 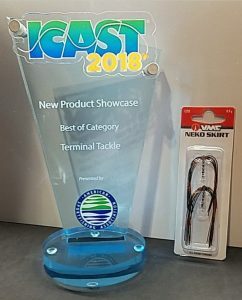 Breaking News: VMC Skirted Neko Weight wins Best in Category! Our skirted Neko rig weights are new. They’re being debuted at ICAST this week. We hope to have them available to the general public sometime in November. They’ll be offered in at least eight colors and at least four weights. Get your order in early for the new VMC skirted Neko weight. They are sure to sell fast. You can preorder them through Tackle Warehouse. I’m really excited about the sport of bass fishing. It just keeps getting better and better. 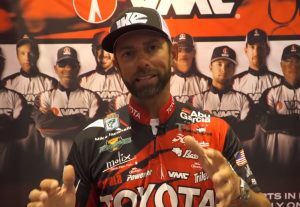 <<< Hear Mike talk about the new VMC Skirted Neko Weight.